The Fat Quarter Shop is excited to welcome Rosemarie Lavin to the Jolly Jabber. Rosemarie's latest fabric collection, Mistletoe from Windham Fabrics, just arrived in our shop- so let's get right to it, a little Q & A with Rosemarie! Q: What was the first seed that grew into the Mistletoe collection? 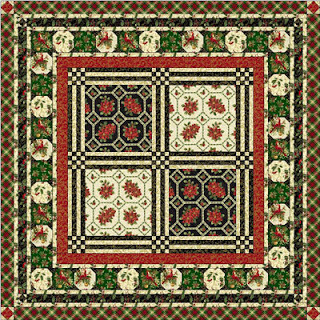 A: When Windham fabrics asked me to develop a Christmas quilting collection, I immediately thought of poinsettias and tartan plaids. I then added beautiful metallic scrolls and a red cardinal print. When I showed it to my husband he said he liked the mistletoe print to which i responded, it's poinsettia and holly, but the name stuck and it became known as the Mistletoe collection. A: I like the poinsettia print. When I designed it, I laid it out so that it can easily be cut into placemats and runners without sacrificing any of the large florals. A: I think it's just perfect for tabletop. 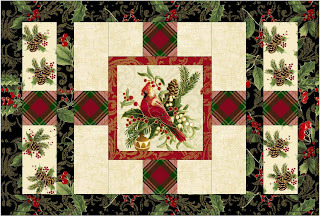 I would love to see the green metallic scroll with the red texture border as a tablecloth coupled with placemats of the poinsettia block pattern on top. I currently live in the same house I grew up in (my grandmother's house) and have spent a good part of my life here on Long Island. 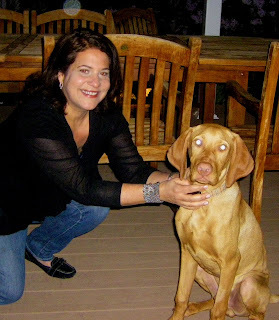 We recently got a new puppy, a Hungarian Visla named Romeo. He's a real mush and a sweet boy so that's how he got his name. We also have our 11 year old cat named Mrs B who actually acts like a dog. When I'm on the train and people's headphones are so loud that I can hear what they are listening to.